I had debated whether to head home the night before or wait until today and was glad I chose to postpone the drive. It gave me a chance to do a couple of interesting summits on the west side of Santa Clarita and Interstate 5 in the hills around Pico Canyon. I spent the night camped along Pico Canyon beyond the last suburban development and found it fairly quiet. Only a few cars came through during the night and none stopped to bother me. 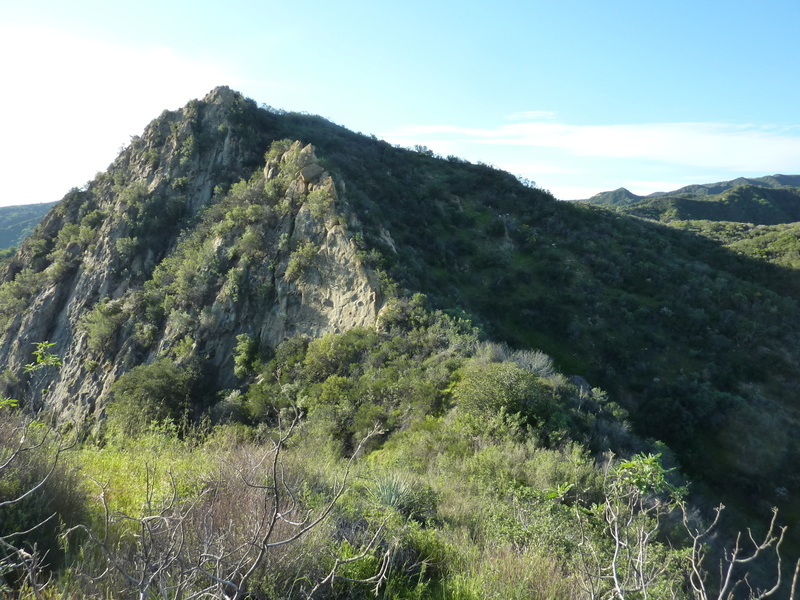 This summit is the highpoint of the ridge separating Pico Canyon to the south from the Stevenson Ranch development to the north. There are some old fences along Pico Canyon Rd, but I found no signs indicating No Trespassing. Though the whole hike was less than a mile in length, reaching the summit is hardly trivial. The slopes are steep and sometimes loose, but a beautiful green during my March visit. I went up one route and down another, the descent route proving a good deal easier. On the ascent I reached the crest of the ridge to the west and then followed the ridge from there. The last hundred feet of gain is along a dangerously crumbly sandstone knife-edge which I cannot recommend. I dropped off the south side of this edge where I could and climbed easier slopes on the west side. Someone has secured a very thin line as an aid to come up the knife-edge, but it would hardly be sufficient in the case of a serious slip. From the summit one can look south over the Santa Susana Mtns and pick out Sand Rock Peak, a very distinctive feature in that direction. East and west you can view along the ridgeline while to the north are the neatly aligned cookie-cutter homes for which Santa Clarita is known. I took some time on the way down to marvel at the variety of flowers found on the grassy slopes I descended.